Restaurant, a casual alfresco dining facing the sea offering breakfast buffet, a la carte lunch, and a la carte or theme night buffet dinner with local entertainment on most night. featuring Pacific Rim including fresh local seafood, US. Prime rib, and other island specialties. Downtown Koror,has over 25 restaurants serving Palauan, Japanese, Chinese, Filipino, Korean, American, Thai, Indian, and Mexican dishes. 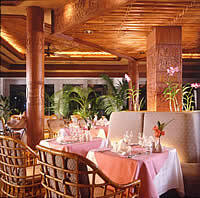 Excellent fresh local seafood is the specialty available in almost all restaurant.